No, it’s not the biggest women’s boxing match of all time but it’s the biggest of a new era in the US and that’s good enough. If boxing is going to have a women’s movement to one day rival the success experienced in MMA, it’s going to take the type of attention, matchmaking, and promotion this one is getting. The 24-year old Shields (8-0, 2 KO), a two-time US Olympic Gold medalist, won a pair of super middleweight belts in her fourth fight and moved down the scale to win three more belts at middleweight. The 28-year old Hammer (24-0, 11 KO) holds the WBO belt and has been part of the title scene at middleweight since 2010. One fighter, barring a draw, walks out with all the jewels available at 160 lbs. 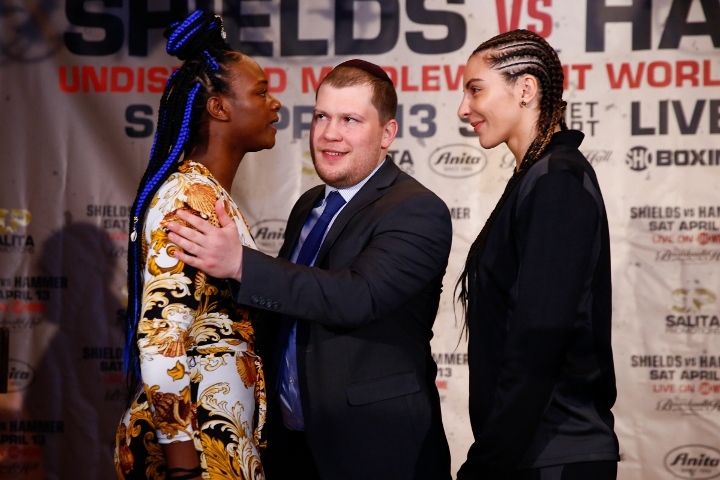 Could the winner lure undisputed welterweight champion Cecilia Braekhus up the scale for a first ever clash of quad-belted champions? One big event is never enough after all. Every fight can’t be a big fight so sometimes that means a champion just has to keep going. Vasyl Lomachenko (12-1, 9 KO) has a pair of lightweight belts and no big fights for the moment so he turns to a former titlist in the class. Anthony Crolla (34-6-3, 13 KO) is seen as a prohibitive underdog but since 2012 his only losses are to Jorge Linares. Maybe he makes a good show of it? Before fans find out, undercard action begins at 8 PM EST. BoxRec only has one half of the main event listed next to TBA but the half we know is enough to watch. 30-year old welterweight Cesar Barrionuevo (34-4-2, 24 KO) isn’t bad TV matched right. His last bout was a one-sided loss to Yordenis Ugas; Friday won’t be the same thing. Flying below the radar this week, FS1 may have a real sleep card on their hands. 35-year old former middleweight titlist Peter Quillin (34-1-1, 23 KO) took well over a year off after being stopped in one by Daniel Jacobs in 2015. He fought once apiece in 2017 and 18 and continues his attempt to get back into contention. While he has mostly been away, 35-year old Caleb Truax (30-4-2, 19 KO) became an unlikely current and then former titlist at super middleweight, splitting a pair of fights with James DeGale. This feels like a fight for persistence and those can be gems. Also on the show, former title challengers Sergiy Derevyanchenko (12-1, 10 KO) and Jack Culcay (25-3, 13 KO) clash at middleweight. 22-year old WBO 154 lb. titlist Jaime Munguia (32-0, 26 KO) makes damn good TV but his ceiling has yet to be determined. Last time out, opponent Takeshi Inoue was underrated coming in and gave a hell of an account. Australia’s 34-year old Dennis Hogan (28-1-1, 7 KO) has never been stopped; could he surprise us as well?